Sometimes a painting job just calls for the power and precision that only comes from a compressed air spray paint gun, especially when you’re working with automotive painting or jobs that call for a tremendous amount of fine control. The G7000 HVLP Spray Gun set from TCP includes a lot of features and components at a very budget-friendly price, and it’s time to determine if it can be called the best compressed air paint sprayer. 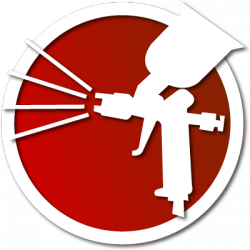 When looking at a compressed air paint sprayer, it’s important to start out with a strong understanding of what makes these types of tools different and unique. As you can probably tell from the name, they utilize compressed air to carry out the actual paint spraying, with the air being sourced from an external machine that creates the air. They are the opposite of airless models, which have an internal turbine for creating the air, and thus offer a very different type of function. The G7000 series, in particular, is made of three separate guns (the G6600-18, the G6600-14, and the G5500) predesigned to offer different sized tips for different applications. Since each model is made with a specific purpose in mind, such as applying primer or completing touch-ups, you can achieve more detailed results in each activity, compared to a model that tries to combine too many features into a single unit. Using these paint sprayer guns first requires you to have an air compressor capable of achieving between 29 and 50 PSI, otherwise you simply won’t be able to achieve the optimal performance and can end up with an uneven coating. In terms of loading the paint into the gun, these models feature a top-loading gravity feed cup, which allows the paint to flow down into the body of the gun where it is atomized by the compressed air. The guns themselves are made of metal, with the cups and other hardware made of stainless steel. You can unscrew the top of the cups and pour the paint right in, allowing for a quicker setup since you don’t have to fully detach and reattach the cups every time. However, it’s best to avoid opening and adding paint to the cups when the gun is connected to a live compressor. These spray guns actually include a lot of controls, which affect the spray direction, speed, and flow, as you would expect on a tool made for precision work. That said, you are going to have to switch between guns if you are going to be performing noticeably different painting styles. For example, applying primer means you’ll need to use the G6600-18, as it’s 1.8mm tip is wider and better able to apply the broad coatings. More detailed, touch-up work, on the other hand, would call for the G5500, since its 1.0mm fluid tip gives you the ability to control the spray for truly detailed coverage. A huge part of the control and precision options on these compressed air paint sprayers has to do with the amount of air feeding into the gun. That means that you need to constantly monitor the pressure to make sure it is appropriate for the type of compound you are spraying, which can be difficult if you don’t have a lot of experience with the process. TCP does attempt to make this easier for you, however, since it includes an inline air pressure regular with the kit, so you can always keep track of the pressure levels of the air entering the gun. Since a great many of the components in these guns are made of stainless steel, it should be relatively easy to clean them after each use. Stainless steel is a rust resistant material, meaning that it doesn’t hold onto certain compounds as much, so you won’t need to scrub the cups a great deal to clean every time. However, rust resistance doesn’t mean that rust can never build up, so you will need to make sure you store the guns in a dry location to prevent any long term damage. The kit also comes with maintenance tools and cleaning brushes, which will help you to properly detach the guns from the compressor hose, change out any nozzles or tips, and thoroughly clean all the components after each use. Having these tools right out of the box is a huge benefit, since you know that they are all compatible and not likely to damage the guns. The Best Compressed Air Paint Sprayer? These sprayer guns are designed with automotive work in mind, which typically calls for the use of special types of paint compounds and a lot of precision painting over fine details, so they are definitely a fantastic choice if you know you’re going to be painting a car or motorcycle. However, if you plan on painting huge walls at a home or office, you’re better off looking at a professional-grade paint sprayer instead.